07 OCT 15 How I Stopped Worrying and Learned to Love Customization The boom was great while it lasted, and the bust, at least in North America, has largely played out. 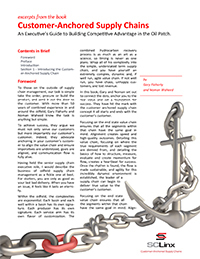 Oil and gas compa- nies and service companies have execut- ed their traditional cyclical playbook, cutting staff and squeezing vendors to protect margins. 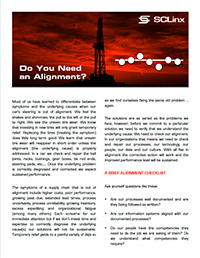 With no quick recov- ery in sight, attention is now focused on more substantial, systemic cost cutting to improve finding and development costs and service company margins. 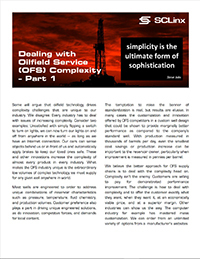 One area of potential savings is the standardization of equipment used to complete and produce oil and gas wells. While all the equipment is “round with a hole in it,” the degree of customiza- tion evident today is staggering. 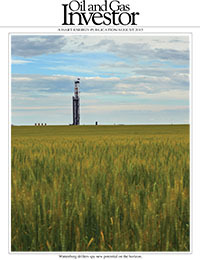 A HART ENERGY PUBLICATION/AUGUST 2015 The downturn is a good time to take a new look at the intricacies of the supply chain and to invest for competitive advantage. voirs and delivering products to the end con- sumers. In total, the processes and the companies comprise the hydrocarbon supply chain. 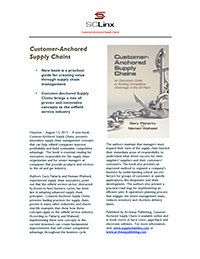 14 AUG 15 NEWS RELEASE: Customer-Anchored Supply Chains Houston – August 13, 2015 - A new book, Customer-Anchored Supply Chains, presents innovative supply chain management concepts that can help oilfield companies improve profitability and build sustainable competitive advantage. Thebookisessentialreadingfor executives responsible for the supply chain organization and for senior managers at companies that provide products and services to the oil and gas industry. 29 JUL 15 Customer-Anchored Supply Chains: An Executive's Guide to Building Competitive Advantage in the Oil Patch Customer-Anchored Supply Chains introduces oilfield service executives to the twin concepts of customer-anchored supply chains and customer-applications as important concepts for setting supply-chain strategy to build sustainable competitive advantage. 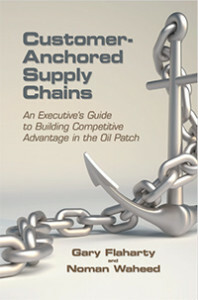 Written for the executive responsible for leading the supply chain organization, Customer-Anchored Supply Chains presents leading practices for supply chain, proven in many other industries, in straightforward terms, showing the applicability to the oilfield service industry. 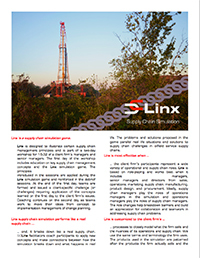 6 APR 15 Linx - Supply Chain Simulation Linx is a supply chain simulation game. 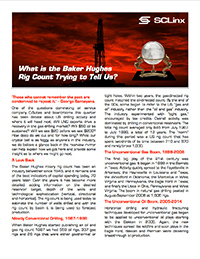 10 MAR 15 What is the Baker Hughes Rig Count Trying to Tell Us? Those who cannot remember the past are condemned to repeat it.’ — George Santayana. 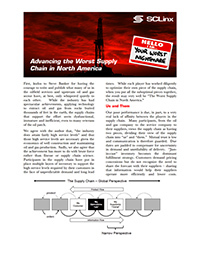 8 OCT 14 Advancing The Worst Supply Chain in North America First, kudos to Steve Banker for having the courage to write and publish what many of us in the oilfield services and upstream oil and gas sector have, at best, only whispered quietly to each other. 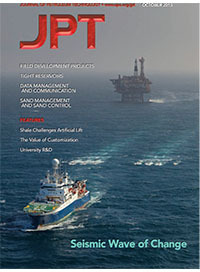 While the industry has had spectacular achievements, applying technology to extract oil and gas from rocks buried thousands of feet in the earth, the supply chains that support the effort seem dysfunctional, immature and inefficient, even to many veterans of the oil patch. 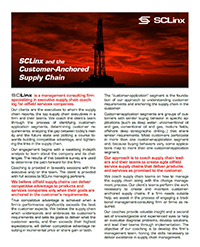 10 FEB 15 SCLinx and the Customer-Anchored Supply Chain SCLinx is a management consulting firm specializing in executive supply chain coach- ing for oilfield services companies. Our clients are the executives to whom the supply chain reports, the top supply chain executives in a firm and their teams. 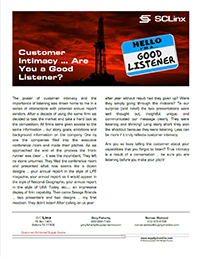 We coach the client’s team through the process of identifying customer- application segments, determining customer re- quirements, analyzing the gap between today’s real- ity and the future state and plotting a course to- wards building competitive advantage, and tighten- ing the links in the supply chain. 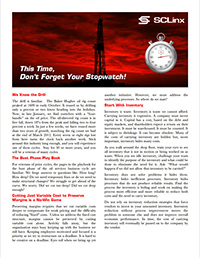 4 FEB 15 New Pages for an Old Playbook — Driving Competitive Advantage Last Friday, January 30th, the Baker Hughes rig count continued its decline with an announcement that the oil-directed rig count fell the most in any single week since 1987. 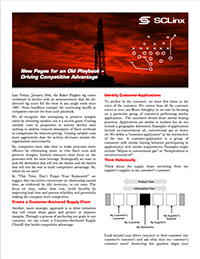 News headlines trumpet the continuing layoffs as companies execute the bust cycle playbook. 24 SEP 14 The Two Most Powerful Words in the English Language On one of his trips to America, Shigeo Shingo reported discovering the two most powerful words in English, at least the two most powerful words in English when it came to business. 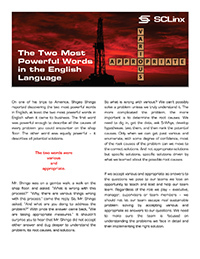 The first word was powerful enough to describe all the causes of every problem you could encounter on the shop floor. The other word was equally powerful – it describes all potential solutions. The two words were various and appropriate.